This is the first installment in a series of articles I plan to write in which I will clearly demonstrate that there is no doubt that the forgery claims made by the Maricopa County Arizona Cold Case Posse concerning the validity of the President’s long form birth certificate are false. I will show that a Xerox WorkCentre multifunction copier/scanner/printer will create a nearly identical PDF file when a similar document is scanned to email using default settings. As readers of this blog know NBC and I have conducted tests using printouts of the PDF file posted at WhiteHouse.gov on two different Xerox WorkCentre models and obtained PDF files displaying nearly all of the so-called anomalies that the CCP and other Birther self proclaimed “experts” have claimed are proof that the PDF was somehow created using some unnamed photo editing software. See my previous articles Xerox for Dummies, Blogger NBC Identifies the “Forger” for the CCP: Grande Commandante Zullo – Better Go Slap the Cuffs on the Xerox Machine, and Xerox Theory Consistent with Ivan Zatkovich Report. How was the Xerox identified as the source of the LFBC PDF file? I could write several articles on that subject alone. It would have been ridiculously easy to identify a Xerox WorkCentre as the source of the PDF except for one twist of fate. 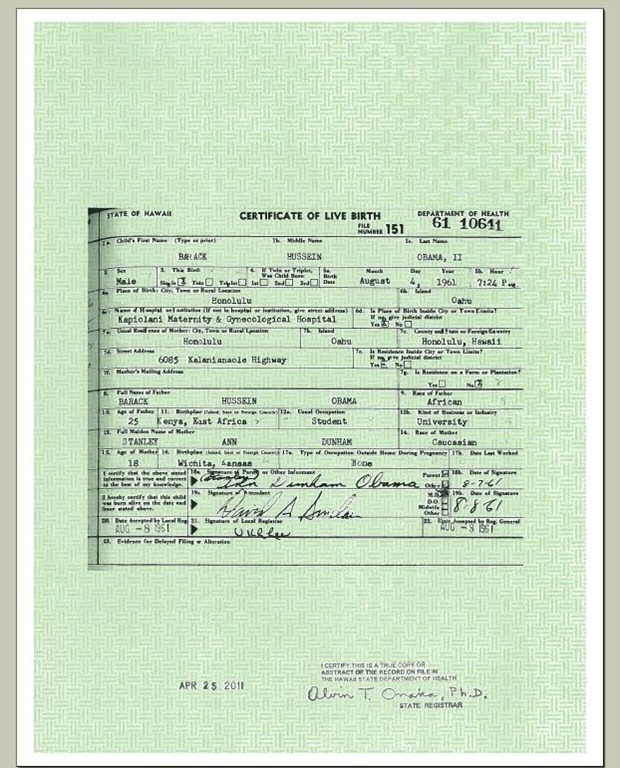 Whoever scanned one of the two certified copies the President’s certified birth certificate obtained from Hawaii resaved it in OSx Preview (most likely to rotate the orientation). The new file saved in Preview is what was posted on April 27, 2011. Preview also happened to obliterate all the metadata that would have identified the Xerox WorCentre as the source of the original scan. In 2011 self proclaimed Birther “experts” like Doug Vogt, Karl Denninger, Mara Zebest, Tom Harrison, and Tim Selaty published claims that the layers and other anomalies were proof that the PDF was a forgery. The centerpiece of the claims was that the PDF file had “layers” and that the layers were evidence the document was somehow assembled by a “forger” who apparently copied bits and pieces from other birth certificates. What none of these Birther “experts” offered was any prior experience in forensic document analysis nor any consistent theory about the workflow that produced the document. Their analyses mostly consisted of statements like “I see this in the document. I have never seen this and cannot explain this therefore it is proof of forgery”. WND hired three real forensic document analysts to opine on the authenticity of the LFBC and none of them found that it was forged. Probably the most renowned investigator of computer images and tampering, Neal Krawetz, addressed the claims of forgery on his Hacker Factor blog and also dismissed them. John Woodman a Missouri Republican and owner of a computer repair business became intrigued by these claims of forgery and determined that he would figure out one way or the other if the LFBC was really forged as some have claimed. Woodman spent hundreds of hours carefully examining every claim and found them lacking. Woodman published a book titled Is Obama’s Birth Certificate a Fraud and ran an active blog where he added many articles debunking other Birther claims. One of Woodman’s key observations was that when the so-called anomalies are examined they all point to a computer algorithm rather than human manipulation. He found for example that letters that touched the form lines tended to be placed in the JPG layer with the green background and the form lines. There would be no reason for a forger to break up words like that. The Cold Case Posse of course completely ignored John Woodman’s offer to assist in their investigation. This should tell you what you need to know about whether this was a serious investigation from the outset. Anti-Birthers and it seemed every legal authority accepted the obvious that the PDF was not a forgery it was just an image of a document that Hawaii has said they produced. Then in late 2011 Arizona Sheriff Joe Arpaio announced that he was going activate his Case Posse to look at the authenticity of the LFBC. This was after a number of members of the Surprise, AZ Tea Party beseeched Arpaio to do something after Conspiracy Nut Extraordinaire Jerome Corsi had spoken at one of their meetings. The history of the CCP investigation is well documented on my CCP Timeline. The CCP drug out the discredited1 analyses of folks like Mara Zebest and Doug Vogt. They also apparently performed some new testing to try to eliminate various scanning software as the source of the PDF. The report that the CCP released is very short on detail and long on conclusion that scanning software using compression could not be the source of the WH LFBC PDF. By 2012 Anti-Birthers like me, NBC (owner of the Native and Natural Born Citizenship Explored blog), and several regular commenters there and at Kevin Davidson’s Obama Conspiracy Theories blog began speculating on what compression algorithm would do what the Birther “experts” like Garrett Papit claimed was not possible: to produce a scan with one 8 bit color layer and multiple 1 bit monochrome layers and to separate a scan into a PDF with layers similar tot he LFBC PDF. I hope Mr. Denninger has been following our work and checks out what is to come in this series of articles. I have a really old, crummy scanner. But based on my poking around, I would put money on the White House having a Xerox WorkCentre color copier/scanner with a “scan to email” feature, rather than anything attached directly to someone’s Macintosh. This would fit the available data, including the MRC artifacts. There is no intrinsic MRC functionality that I can see in Mac OS Quartz, so it’s much more likely it came from the scanner with MRC compression already in place, and WorkCentre copier/scanners do come with MRC built in. It is surprising in hindsight that someone didn’t immediately look at performing actual field tests on a Xerox WorkCentre. However, it is not as simple as it might seem. First, one would have to have access to such a machine. Second, no rational person really had any doubt that the forgery claims were nonsense by that time. Personally, I had invested the time to investigate the Birther claims and found them all lacking. The 2012 presidential campaign was underway and most of the focus was on the crazy series of ballot challenges filed by Birthers. Many of those concerned not the LFBC but the definition of natural born citizen. In the few hearings where Birther “experts” like Paul Irey and Doug Vogt were allowed to testify the judges ruled they were not experts and contributed nothing. Second, the suggestion was buried in a comment on an active blog that receives hundreds of comments per week. It was lost to me and probably others in all the noise of Birther discussions. Also, it was only a suggestion and there are many similar office machines out there from multiple manufacturers. Who knew which one to check? Finally, the Xerox WorkCentres are very expensive machines and usually only available at larger offices. Most models sell for $10,000 and up. They are not your typical home multifunction printer-scanner-fax that one would have handy. I must credit W. Kevin Vicklund here for it was he who remembered justlw’s comment and Kevin did follow up later. justlw turned our to be spot on with his comment. The discussion of compression algorithms continued on several blogs and eventually focused on one particular algorithm: Mixer Raster Content or MRC compression. The reason for the focus on MRC compression was that it seemed to do some of the things seen in the LFBC PDF. It was designed to handle documents that contained a mixture of images, shapes and text and compress these to very small PDF files. Kevin Vicklund found Xerox patents on MRC compression, He commented on these at Obama Conspiracy Theories and linked one of the Xerox MRC compression patents. NBC then found a file posted on the Internet that showed the creator was a Xerox WorkCentre and consisted of the layers as predicted by the MRC patents. The stage was now set for some testing. NBC then made an important discovery. He found that the Obama 2011 income tax returns posted on the WhiteHouse.gov website in PDF format showed the creator was a Xerox WorkCentre 7655. This meant that at least one Xerox WorkCentre was installed at the Executive Office of the President and that there were likely more. Now it was time to do some testing. NBC was fortunate enough to have access to a Xerox WorkCentre 7655. He printed a color copy of the LFBC and scanned it to email on the WorkCentre. His results were remarkable. He saw a PDF file very similar to the WH LFBC PDF with one 8 bit JPG layer and multiple 1 bit monochrome layers. The signature stamp and date stamp were separated into their own layers too. Karl Denninger’s challenge had been met without even using an original birth certificate but instead using a lower quality print out of the WH LFBC image. As luck would have it I happened to obtain access to a Xerox WokCentre 7535 shortly after NBC ran his tests. I was able to duplicate his results by scanning a color printed copy of the LFBC. I wrote several articles on the results that are linked above. Now we had shown that most of the anomalies in the WH LFBC PDF could be explained using even rudimentary tests. The layers, the movable date stamp and signature stamp, the separation of the green background and form in a JPG layer, the white “holes”, the sepration of most of the text in another layer, all were demonstrated. One anomaly that remained was the white halos. We couldn’t use a print out of the WH LFBC since it already had the halos. That will be addressed in Part II…..
1 Some readers might object to my use of the term “discredited” to describe the opinions of the self appointed experts like Doug Vogt. Mara Zebest and others. However, the actual experts hired by WND and Neal Krawetz disagreed and no legal body has found their analyses to be of any value. The MCSO Cold Case Posse has embraced their view but my conversation with an official even within the Maricopa County Sheriff’s office indicated that the CCP is not taken seriously. When a member of the CCP asked the Maricopa County Prosecutors Office to move on the evidence gathered by the CCP he declined and said nothing presented indicated a crime had bee committed. This entry was posted in Birth Certificate, Xerox and tagged Birth Certificate, Cold Case Posse, John Woodman, Mara Zebest, Mike Zullo, NBC, Xerox. Bookmark the permalink. Well, shucks. I should say that if I saw WorkCentres earlier than others, it’s because I stood on the shoulders of other intartube commenters — either JPotter or NBC, or both, if memory serves. I’m certain I’d seen one or both of them mention that the artifacts were very MRC-ish, and after seeing that Quartz had no MRC in it, the next obvious conclusion was that the scanning device itself must have had it built in — and looky there, there’s a whole line of commonly deployed office-grade systems with MRC built in! And of course I’d be remiss not to give all due credit to the CCP and the TPPH for making the most ridiculous claim possible, just begging for falsification: that the artifacts could only have been the product of human intervention. How “commonly”? Is it fair to expect anyone who claims to be an “expert” to know this without needing to do research? I’ve mocked the CCP many times for not knowing about the existence of Xerox machines with MRC, but I’m wondering if I’ve been unfair. I remember, I did search for other WH-documents in 2012. I had ~100 , looked for halos and searched for keywords. Probably “preview” and such – no success. Then I searched the web for similar halos, also without much success. they had used – no response. Check out part two for two documents scanned on a Xerox WorkCentre that exhibit halos. Did you really expect the White House to respond? the halos are produced by the MRC software ? Before preview sees it ? compression, of the background layer. should just have checked the products of the major scanner producers. There can’t be so many. You Obots put a lot of work into this horseshit. Even though it was obvious to anyone with knowledge of technology and the law that the claims of birthers about the IMAGE of the birth certificate were both wrong and irrelevant, it was nice to see someone _prove_ them wrong. not so obvious. Many knowledgable people got it wrong. It was quite some work required to examine it. Could this have been avoided ? Improved ? There should be some system in place to examine the truth of such claims. An open internet system with discussion. and not open and biased by nationality. What “knowledgeable people” thought that the DIGITAL PICTURE on the WH website was an actual document? What “knowledgeable people” thought that the process by which it was scanned and uploaded had any relevance to the authenticity of the certified copies or the original? The truth of those claims _was_ examined, and found to be lacking. As was the truth of the WMD claims, which was also found to be absent. The difference is that, in 2003, most of the country was participating in our post-9/11 National Nervous Breakdown, and didn’t pay attention to rational examination, while this time only a small minority embraced insanity. the falsification would still be a very bad thing for a president, reducing his credibility. > uploaded had any relevance to the authenticity of the certified copies or the original? it would identify Obama/WH as dishonest liars ?! > The truth of those claims _was_ examined, and found to be lacking. that’s what one group said, while the other group claimed the opposite. > As was the truth of the WMD claims, which was also found to be absent. > while this time only a small minority embraced insanity. then and now the average people didn’t dig into the details. I did ask “What people thought … ?”: I asked “What KNOWLEDGEABLE people thought … ?”. Every one of those people you listed has expressed (not necessarily honestly) a lack of understanding of the fundamental fact that “a picture of a document” is NOT “a document”, and demonstrated a lack of knowledge of the technology involved. Did I mistranslate knowledgeable ? Well known, respected in their audience, in big populations. They had some expertise, did analyze the thing. was only found after 2? years. similar cases in the future ? how to handle that MH17 discussion, how to find the truth ? Yes: the dictionary definition of the word includes “well-informed”. People who think the PDF is “a document” are not. People who think the ordinary artifacts of a widely-used scanner are “anomalies” are not. They had no _relevant_ expertise. If they had, they never would have “analyze[d] the thing” in the first place: they would have known it was irrelevant, and they wouldn’t have gotten their “analyses” so thoroughly wrong. Bull: they were available at the time. Several people with _real_ expertise pointed out that the whole notion of what they were doing was nonsense. 1. Ask them to tell you _exactly_ what law has been violated. If they had tried to, it would have been immediately obvious that there was no “forgery”, because a _picture_ of a document cannot, by definition, be one. 2. Demand that they show you proof of their alleged “expertise”: professional certification and/or experience _in the area where they’re offering opinions_. None of the phony birther “experts” had ever been consulted by anyone about the authenticity of digital documents, or about establishing the authenticity of a real document by examining a picture of it. > of a document cannot, by definition, be one. asking typically gets no replies. This includes the White House, btw. critics, but there was no real reply and discussion emerging. on the WH-webpage would have been a severe thing. > professional certification and/or experience _in the area where they’re offering opinions_. > a picture of it.